MINI Cooper Acccessories + MINI Cooper Parts :: OutMotoring.com MINI Blog :: MINI Performance Parts :: John Cooper Works - and plays! Wow, this shift knob is sweet! It is a bit expensive, but after seeing the John Cooper Shift Knob and feeling the heft and quality I was sold. 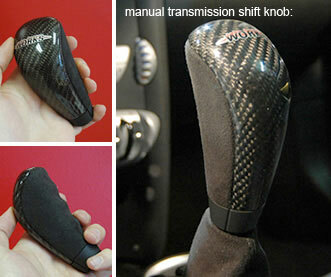 It's one of the only 'aftermarket' shift knobs that actually fits 100% on the MINI shifter. It looks awesome and feels great. It's an official MINI part, so it is made to the same high standards as their other products. Top and rear facing surface is carbon fiber while the lower/front/under side is alcantara suede or leather. Also fits the Alta SS Kit, BM, Cravenspeed Short Shift kit. Comments on John Cooper Works - and plays!